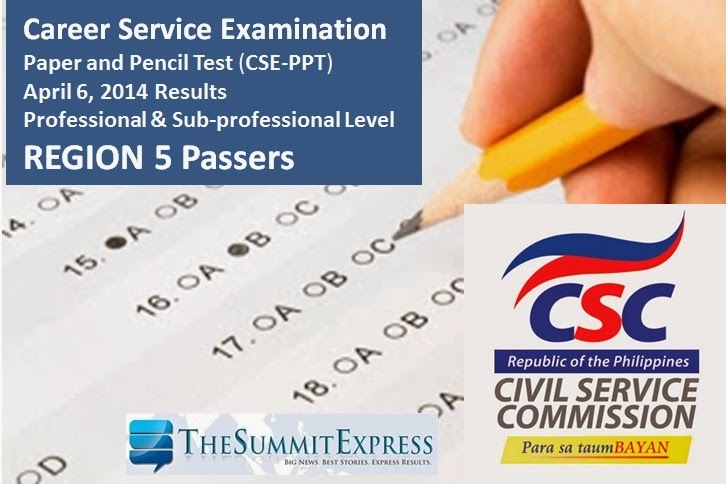 Manila, Philippines - The Civil Service Commission(CSC) has finally announced the results of April 6, 2014 Career Service Exam- Paper and Pencil Test (CSE-PPT) also known as civil service examination on Monday, May 19, 2014. The complete list of passers for Professional and Sub-professional level for Region 5 (Bicol region) are available on this page. CSC said that nearly 200,000 examinees took the Civil Service Examinations in 52 test locations nationwide. Passers of the the CSE-PPT exam must personally claim their Certificates of Eligibility at the CSC Regional Office/Field Office upon presentation of required documents. On the other hand, those who failed the examination may secure a copy of their Report of Rating through the CSC website. No Report of Rating shall be mailed to those who failed. To secure a copy of the Report of Rating, an examinee must key in his/her name, date of birth, examinee number, examination date, and examination type. Thus, examinees are advised to safe keep or remember their examinee number until receipt of the examination result.